(Ming Pao) Besieged City (圍城). By 胡幗欣. July 16, 2006. In the Adventure Paradise inside Chung Fu Mall of Tin Shui Wai district, a middle-aged woman is playing a ball game on a machine. Each time she presses the button, a plastic ball falls down from the top of the screen. If it falls into the right spot, she will earn points. Next to the game machine is a baby carriage. The formerly asleep baby has opened her eyes. She kicked her little feet and the blanket slid to the ground. The woman saw that, picked up the blanket and set it down again. Then she continued to press the button to wait for the next little round ball to drop down, possibly into a hole that will bring her a prize. Then the baby began to cry for attention. The woman picked the baby up with the left arm while her right hand continued to press the button. More and more people are standing behind the woman to watch her play, including men, women and children. But among everybody, only the reporter was interested in the baby. "No. There is another daughter now in middle school." "What was the maximum amount that you have spent on games in one day?" The baby leaned quietly on her mother's shoulder, her little eyes darting around the scene. The 1,000-square-feet-plus Paradise has become the place for the women of Tin Shui Wai to hang out, chat and play games, while the children play on the other side. Further away, an old lady is probing the coin slots in the hope of finding loose change left behind. Everybody loves paradise, because they believe that they can find happiness in paradise. Today's Tin Shui Wai was the "paradise" in the hearts of many once upon a time. They had hoped that they would find a happy abode in this new town far away from the hustle and bustle of the city. But many of these wishes have not been realized more than ten years later. It is hard to imagine that the actual Tin Shui Wai was like as imagined -- one after another identical tall building formed a modern "besieged city." In contrast to the 34 degree Fahrenheit temperature outside, the cool air inside the Adventure Paradise was comfortable. Tin Shui Wai (天水圍). The name gives the impression of a vista in which heaven (tin天) is joined with water (shui水). 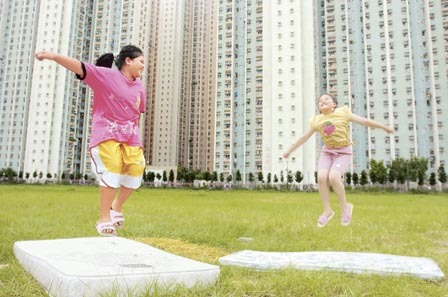 "The overall plan of Tin Shui Wai is quite perfect. Education, healthcare, community, cultural and recreational facilities are all present and sufficient to meet the needs of the community residents ... in a short ten years, Tin Shui Wai was transformed rapidly from a quiet rural village into a modernized new town. This is result of the efforts of the government and the Housing Authority to construct the community and satisfy housing demand." Former Chief Secretary Anson Chan said so ten years ago. The "perfect community" in Anson Chan's words has achieved six "Number one's" and two "Number two's" ten years later: the Yuen Long district in which Tin Shui Wai belongs has the highest proportion of population under 14 years of age; it has the highest incidences of child abuse, spousal abuse, unemployment welfare, senior citizen welfare and requests for help about suicide in Hong Kong; it is number two with respect to the number of criminals between the ages of 10 and 20; it is number two in median household income in Hong Kong. Apart from a whole bunch of "Number one's" and "Number two's," there are mass suicides, a man chopping up his wife and daughter and various other human tragedies. The happiness that Tin Shui Wai provides its residents is less than that from the Adventure Paradise that calls itself an "indoor theme park." The definition of happiness changes among people. But when I chatted with the Tin Shui Wai residents, I sensed that their happiness is small while they have plenty of complaints and bitterness. Last Thursday afternoon, inside the family service center of the Tin Yuet Estate of Tin Shui Wai, several young children were playing on the floor. Mrs. Chan and her daughter were sitting on the side, reading newspapers and books. It was tranquil. "Many neighbors come here in the morning. This is the summer break, and many parents have taken their children back to their home towns." Mrs. Chan said that she did not come to the center for help. She just wanted to find some place outside of their home where the children can read in quiet. There is one public library in Tin Shui Wai inside a shop space at the Ginza Plaza of the Kingswood Villas. Construction of the central library of Tin Shui Wai will begin in 2009 and finish in 2011. When asked what she thought of Tin Shui Wai, Mrs. Chan said without hesitation: "This place disgusts me (乞我憎)." She said that the district has no library, no standard swimming pool and no hospitals. There is only a concrete jungle. "Even if there is a number 10 typhoon signal, the winds could not get in." Among the neighbors, there are not many unbroken families. There are many gangsters at the ball fields ... "When my children get older and my economic condition improves, I will definitely leave here." Mrs. Chan's family used to live in Kowloon. More than ten years ago, her son was born prematurely and weighted less than 2 pounds at birth. The doctor told the Chan's to make sure that their son get more fresh air. So they moved to Tin Shui Wai as pioneers. At the time, they thought that Tin Shui Wai was "paradise" and they had to make an "adventure." How has Tin Shui Wai improved over the years? "Transportation is better with West Rail." A community that has been built for more than ten years still has few developments to speak of. Among the advantages of Tin Shui Wai is just the air quality. "I know that rich people look down on me and call me 'Tin Shui Wai housewife.' The new immigrants feel that I don't know Yuen Long and I don't join their circle. So they ask me, 'How can someone like you be called a Tin Shui Wai person?'" Mrs. Chan lives in a public housing estate. Her husband is in construction. Her family is not as well off as those 'rich people' living in the low-density private houses. But she will not socialize with the grassroots "Tin Shui Wai people." Within this small community, there is a situation of social stratification in the manner of a multi-layered cake (夾心階層). On holidays, the Chan family will "go into the city" in Kowloon and they rarely walk around the streets of Tin Shui Wai or Yuen Long. She has lived there for many years, but she still does not know the streets in town. But she is naturally happy and she gets along with husband and two children. After we chatted for a while, a young man entered the service center and sat next to Mrs. Chan to read. This tall young man was the baby who weighted less than 2 pounds once upon a time. At the recreational area of the public housing estates, all the children are soaked in sweat under the sun. At the club house of the Kingswood Villas, Mrs. Cheung's daughter was having fun but she had no sweat. In his air-conditioned game room, everybody has to take their shoes off. Mrs. Cheung is comfortable with her daughter playing here. Mrs. Cheung and family lives at the Kingswood Villas, and they are what Mrs. Chan describes as the 'rich people.' Mrs. Cheung has a part-time job in the Central district in Hong Kong. Her husband is in advertising and frequently travels to the United States. Mrs. Cheung and her husband are permanent residents of the United States. Ten years ago, the two moved to Tin Shui Wai because it was hard to buy an apartment in the city, it was easy to travel to mainland China for business and the air quality was good. But she also gave a label to the public housing residents: "Sometimes when I go to the street market or take a bus, I come close to the public housing residents. I find that they are more crude and they are a bit inferior." Mrs. Cheung has lived in Tin Shui Wai for ten years. Her "area of activity" in the district is restricted to her residential estate and club house. On holidays, she goes with her family to Tsim Sha Tsui or Tai Koo City. Apart from going to the street market and super market, she will not go to the neighboring housing estates. She said that when her 4-1/2-year-old daughter finishes third or fourth grade in elementary school and has a foundation in Chinese, she will move to the United States. Before that, her daughter will be attending either directly subsidized or private elementary schools in the district. "I don't want her to attend the public estate schools. If she hangs around the children from the public housing estates, she will be influenced." What kind of influence? Bad influence? "Definitely." On the division between the public housing estates and the private homes, Mrs. Cheung's ideas are close to the mainstream: There are too many new immigrants in Tin Shui Wai and the infrastructure is inadequate. "Some of these are existing problems that cannot be automatically corrected. The government must help out." 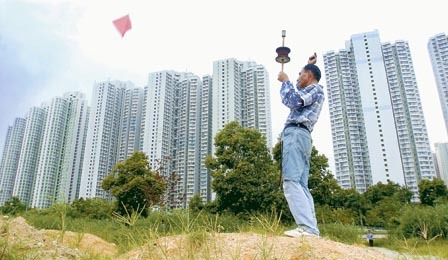 From the numbers alone, it is hard to say that the public facilities in Tin Shui Wai are inadequate: three combined family service centers; one team to provide family protection and child services; one welfare service planning and coordination committee; two welfare service coordination systems; one combined youth service center; one senior citizen center; two new combined service centers will be coming into service soon. How about cultural and recreational facilities? It has one district library; three mobile library service stations; one public swimming pool; one sports auditorium; one major park; many smaller parks and playground; and there will be more sports auditorium, local resting areas, seven-person soccer fields and basketball fields, district resting areas, public library/sports auditorium, cultural center, district plaza and a small library. Whenever the subject of Tin Shui Wai comes up, the above statistics are repeated again and again by the government officials in order to prove that the problems of Tin Shui Wai are not due to the infrastructure. But Chief Executive Donald Tsang admitted during last week's Legislative Council's Q&A session that the community facilities in Tin Shui Wai are inadequate and that the government made omissions during the planning of Tin Shui Wai. So the next time when a problem occurs, will the authorities repeat the numbers above or admit once again that there were "omissions"? Will this paradise which combines 'education, healthcare, community, cultural and recreational facilities' have to wait another ten years before it appears in front of the 'Tin Shui Wai people'? The following is an old post from the EastSouthWestNorth blog (version 1.0), dated December 13, 2003. These are two different paths by which a city could have chosen. 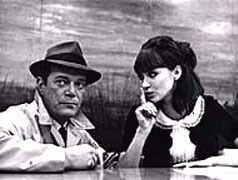 Alphaville is first of all the name of the futuristic city in Jean-Luc Godard's movie of the same name. 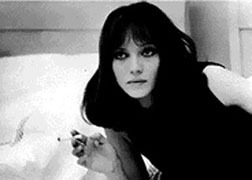 In that movie set in some future age, a super-computer named Alphaville-60 is in charge, to the point where the citizens have given up their ability to think, communicate and love. It took an agent named Lenny Caution from the mythical Outland to destroy the machine (and win the girl). This is the second interrogation scene from the movie. ALPHA-60: The complexity of Alpha-60 imposes the necessity of programming in light year sectors. Last night you lied. CAUTION: Why did you want to get rid of Henry Dixon. What did he do? ALPHA-60: Your name is written "Ivan Johnson," but it is pronounced "Lemmy Caution," Secret Agent Zero Zero Three of the Outlands. You are a threat to the security of Alphaville. CAUTION: I refuse to become what you call "normal." ALPHA-60: Those you call "not normal" are far superior to ordinary men, whom we have practically eliminated. CAUTION: It's unthinkable. You can't destroy humanity for your own purposes. ALPHA-60: I, Alpha-60, will calculate to make our failure an impossibility. CAUTION: And I'll fight to make your success impossible. ALPHA-60: All I set out to do will be done. CAUTION: Don't be sure 'cause I know a secret. ALPHA-60: What is your secret? Tell me. Mr. Caution. CAUTION: What I know never changes, neither with day or night. And the past represents the future. It advances in a straight line. And when it's arrived, it has formed a full circle. ALPHA-60: I cannot calculate what it is. CAUTION: You needn't ask me. ALPHA-60: Several of my circuits are working on the solution to your riddle. I will solve it. CAUTION: Yes, you'll solve it. And you'll destroy yourself the moment you do. But when you do, you'll become like me where you'll be my brother. ALPHA-60: Those who are yet unborn do not weep and feel not regret. It is therefore logical to condemn you to die. CAUTION: Oh, to hell with you and your screwy logic. ALPHA-60: My judgments are infallible. CAUTION: If you try to get us out of the other galaxies, you'll never make it. ALPHA-60: You cannot escape. The door is locked. CAUTION: Try to stop me, pal. 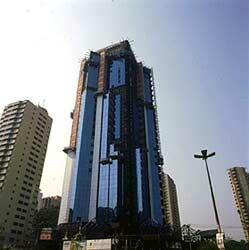 The other Alphaville is located in the city of São Paulo, Brazil. And the door is locked so that no escape is possible. Communities like Alphaville in the outskirts of São Paulo, Brazil, are a sad reflection on the kind of society we now live in. Crime is making São Paulo a city of fear. People are staying at home more often and, when they do go out, choose shopping centers rather than risking going to a particular restaurant or cinema. To escape the threat of violence and crime many Brazilians dream of living in closed communities, such as Alphaville on the outskirts of São Paulo. The Alphaville concept was set created 30 years ago and aimed at setting up the kind of suburban life style enjoyed by middle class Americans who had turned their backs on the inner cities. Alphaville has been successful that it has spawned "franchised" communities in other areas of Brazil. The people who live there are usually middle-class Brazilians and expatriate businessmen. These places are generally spacious and families can live in houses instead of apartments and their children can walk and play in the streets with relative security from traffic and thieves. Alphaville is not one community but actually a series of closed areas within a greater district, linked by road and open to the general public. This, in fact, gives it a less repressive atmosphere than some of the more exclusive closed areas. I once visited a place in Chácara Flora in São Paulo and was struck by the absence of people, except security guards, gardeners and maids, and the lifeless atmosphere. I was visiting a senior executive from a multinational company who lived with his family in a beautiful big house. In terms of their link to Brazilian society, they may as well have been in Los Angeles, Singapore or Moscow. While I understand the motives of those who live in such communities, I feel think they are a sad reflection on the kind of society we now live in. Unfortunately, crime is making São Paulo a city of fear. People are staying at home more often and, when they do go out, choose shopping centers rather than risking going to a particular restaurant or cinema. There was an interesting item in a newspaper a few months ago about Jamelli, a Brazilian football player for Corinthians, who had returned to São Paulo after five years in Spain. He confessed that he was no longer accustomed to the menace of crime and was so afraid of being held up in his car that he had stopped going out in the evenings. Another player, from Uruguay, said his wife refused point blank to leave their apartment block because she was afraid. One of the reasons why this woman was frightened was because she was a regular viewer of sensationalist television programs shown early every evening, which highlight crime, violence and gory traffic accidents. The TV stations have helicopters hovering over the city like vultures seeking out blood. One station recently followed police chasing a gunman who had escaped into a wooded area. The police shot him dead and, with the helicopter hovering a few feet above the scene, the cameras showed live coverage of the wretched thief's body being dragged through the undergrowth and thrown onto a stretch of road like a piece of garbage. To cater to this fear of going out, new buildings are increasingly including a gymnasium and even a video rental store within the complex. How to solve the problem of crime? There are no easy answers. The problem of crime is rooted deeply in the social system. Brazil is a country with extreme inequality, with a small elite controlling the wealth and power and a huge powerless under-class living at subsistence level. Constitutionally, Brazil is a democracy. But the Brazilian democracy has some unique developments: "the justice system is ineffective, justice is exercised as a privilege of the elite, individual and civil rights are delegitimated, and human rights violations (especially by the state) are routine" (Caldeira, City of Walls: Crime, Segregation and Citizenship in São Paulo, p.372). In turn, the rhetoric on crime has now included a host of complex issues: "the elaboration of prejudice in the talk of crime, the symbolic re-creation of inequalities just as democracy took root, the support of police violence and of private and illegal measures of dealing with crime, the walling of the city, the enclosure and dislocation of the rich, the creation for fortified enclaves and changes in public space toward more explicitly separated and undemocratic patterns, the disrespect of human rights and their identification with 'privileges for bandits,' and the defense of the death penalty and summary executions" (p.373). Caldeira closes her book with these two sentences, "Brazilian democracy will probably continue to be unique, but if it aspires to be less violent, it must not only legitimate the justice system but also stop playing out its games of power and abuse of authority on the bodies of the dominated. It will have to find ways to democratize public space, renegotiate borders, and respect civil rights" (p.375).